Spotlighting the importance of literature and the power of reading as key to connecting with and understanding the world around us, Emirates is celebrating its 10th year of supporting the Emirates Airline Festival of Literature. The airline has been a key to the growth of the festival, which has become a mainstay on the Dubai cultural calendar. The festival started in 2009 with 65 authors coming from 21 countries. Emirates was an airline that connected Dubai to 99 destinations with 127 aircraft in 2009. Since then, Emirates has carried over 1,000 authors to the festival from over 65 countries, enabling the festival to showcase inspiring line-ups of talks, workshops and performances featuring some of the best authors, thinkers and writers from all corners of the globe. Today, the airline serves 159 destinations in 85 countries and territories on nearly 270 aircraft. This year, the airline will engage visitors to the Emirates Airline Festival of Literature with innovative on-ground experiences. Emirates’ on-ground activations will run from 2-3 March and 9-10 March at the InterContinental Hotel Festival City. This year, Emirates will let visitors explore the breadth of its destination network and its children’s product using innovative technology. By utilising Xperia technology with state of the art touch functionality, special games have been developed to challenge visitors to match images and names of top Emirates destinations as well as ‘Fly with Me’ animals. An interactive route map detailing Emirates’ worldwide network will enable visitors to view content on the screen and then enter their favourite travel memory the last time they travelled on the airline for a chance to win Economy class tickets to any destination on the Emirates network. Emirates has also collaborated with Lonely Planet Kids to create a colouring wall focusing on children’s holidays. The Lonely Planet Kids area will also include bean bags for children to lounge and read their favourite books. Popular ‘Fly with Me’ animal mascot Lewis the Lion will also be roaming around the festival and children will have the chance to take a photo with him. Bespoke bookmarks developed by Emirates to celebrate the 10th anniversary will be handed to visitors who purchase a book at the festival. 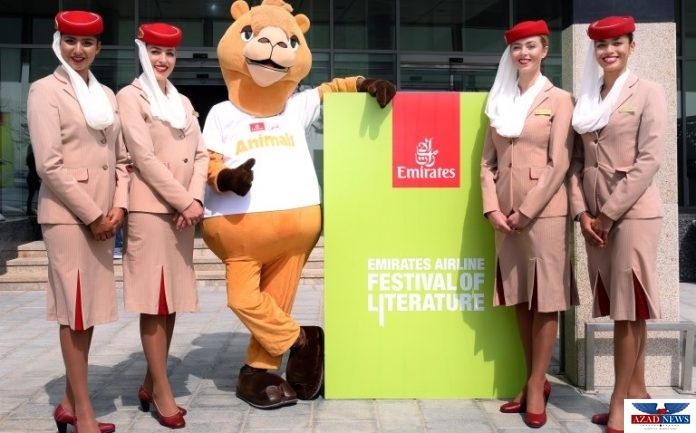 Emirates has been the title sponsor of the Emirates Airline Festival of Literature since its inception. The Festival is one of several notable cultural sponsorships that Emirates is involved in, the airline views the Festival as a valuable platform to engage with its customers as well as support the growth of arts and creative industries in Dubai.